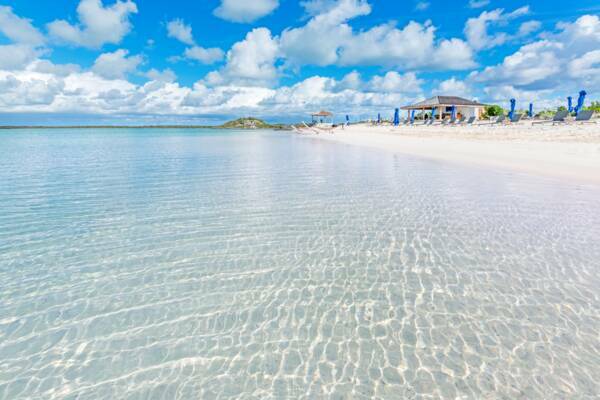 The Cove Beach is located on the sheltered Bell Sound Lagoon on South Caicos. The crystal clear water at the Cove Beach. This beach is part of the greater Bell Sound National Park area of South Caicos. As such, fishing is prohibited both from the beach and within the sound. This is usually the preferred beach for guests of the resort, as the eastern beach (Long Beach) can be a bit choppy at times. Due to the Cove Beach’s sheltered locations, it’s usually quite calm. To the northeast is a non-contiguous portion of the beach which is also rather nice. This beach is located west of Sailrock Resort, on the north-eastern part of Bell Sound. It’s a short walk from the resort (.3 miles), and there’s complimentary shuttles back and forth for guests. Simply inquire at the front desk or the beach bar for a ride. To the north of the beach is the small islet of Iguana Cay (not to be confused with Little Water Cay (Iguana Island) near Providenciales). Due to the location of this beach, there is generally no seaweed or flotsam present, and it’s frequently raked and cleaned for guests. 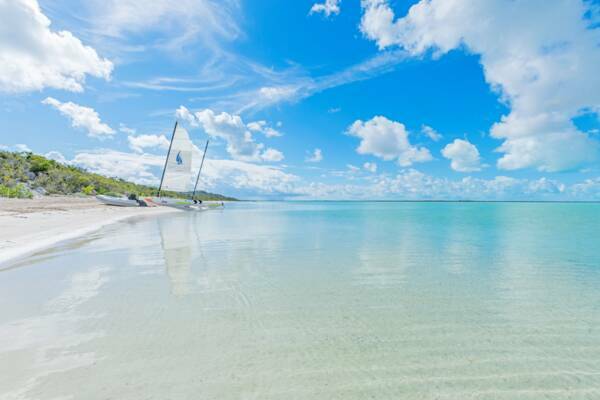 To get to the Cove Beach, simply follow the road to Sailrock Resort and Plandon Cay Cut Beach. It’s the left turn right before Sailrock Resort (150 feet before), and it’s a short 500 foot drive down the access road. The Cove is perfect for water sports such as Hobie Cat sailboats, kayaks, and paddleboards. Sailrock provides complimentary access to Hobie Cats, kayaks, paddleboards, and snorkelling gear for guests and day-pass holders. Both touring and clear acrylic kayaks are provided, along with life jackets. Staff from the beach bar will assist you in preparing the gear and advise on appropriate directions to go. For those sailing the Hobie Cats, the water is shallow to the south (left if you are facing the water), although depth depends on the tide. You’ll notice this if you sail in this direction, as the rudders will begin to scrape the sand long before the hulls. You’ll have plenty of time to change course. Although some fish can be seen near Iguana Cay and in the mangroves to the east of the islet, there unfortunately are not any good snorkelling reefs in this area.